Life can change in an instant. And, when it does how will you survive the slick roads you may have to travel? The Slickery Road is a blog about the roads in my life and how faith in Christ leads me on. When I was a kid, Sunday nights meant a visit to my grandparents’ house. Grandma and grandpa lived just a few minutes away from my childhood home, so their’s was a convenient stop for my family on our way home from church. My sweet grandma kept my older brother, Kevin, and me in good supply of her homemade molasses cookies, and allowed us to watch television while the adults visited. I recall watching many an episode of Alice, The Jeffersons, and Trapper John, M.D. on Sunday nights in the living room of my grandparents’ house. Good times. Grandma also kept a stash of toys and books for us in the closet just off the living room. She had all sorts of goodies in that closet. A Rubik’s cube, a View-Master, Yahtzee, and books with nursery rhymes and fairy tales. I must have read “Goldilocks and the Three Bears” a thousand times at my grandparents’. Despite its many adaptations, most of you are probably familiar with the version of this popular fairy tale in which Goldilocks, a little girl aptly named for her golden locks of hair, stumbles upon a home belonging to a family of bears. The bears – Papa Bear, Mama Bear, and Baby Bear (creative names, no? )- are out for a stroll while their porridge cools. In the meantime, Goldilocks takes it upon herself to walk right on into their house like she owns the joint. In her quest to get all comfy and cozy, she gets all up in their business by sampling each of their bowls of porridge, each of their chairs, and each of their beds. Awkward. It’s a wonder little Miss Manners didn’t opt to use each of their toothbrushes too! Any who…in Goldie the home invader’s opinion, Papa Bear’s stuff is too hot, too big, or too hard. Mama Bear’s is too cold, too small and too soft. And, Baby Bear, poor thing, his stuff is always, “just right”. So, she eats all his porridge, breaks his chair and takes a siesta in his bed. When the bears return, they find Goldilocks asleep in Baby Bear’s bed. Goldilocks then wakes up and runs out of the house all scared like. Perhaps next time she won’t be so quick to um, I don’t know… go into a stranger’s house and make herself at home. Sheesh. Crazy girl. Too hot. Too cold. Too hard. Too soft. Too big. Too small. All too often, I find myself thinking those thoughts in regard to God’s word. Instead of just taking it for what it is, I set off in pursuit of the "just right”. On the hunt for something more palatable. Something I can easily digest, settle into, and feel all comfy, cozy about. But, I gotta tell ya, I have yet to find a copy of the Bible in which the Lord says, “Hey Angela, why don’t you take the liberty of twisting and interpreting my words so they fit your needs and justify your actions”. I really didn’t realize how much I do this until recently….You see, about a month ago, I found myself in the middle of a discussion with regard to whether women should be allowed in leadership roles in the church. Having served in a leadership role in the church in the past, and being in a quasi-leadership role currently, I was very interested in knowing what the Bible says about this particular topic. Some in the discussion cited scripture references which they felt supported their feeling that women should not be in leadership. Others felt the scripture was “out of date” so to speak, and “didn’t really apply” to current day. And, then there were some that felt the case depended upon the woman in question, her spiritual gifts, and her calling from the Lord. “It really depends on her heart”, they said. For as many arguments supporting one point of view, I found just as many to support the other. By the time I absorbed the petitions for each stance, my head was reeling with information…and, I still didn’t know the answer. I knew where I stood, but I wanted to know the answer. The just right answer. I was confused, and to be totally honest, I’m still kind of confused. It seemed to me everyone engaged in the conversation, including myself, was sampling scripture. “This one is too hot. This one is too cold. This one too hard….” All of us trying to find what felt or tasted just right and justified our stand on the topic. The whole stinkin’ discussion took me for a loop. It challenged me. I felt I had failed in some way as a Christian….as a woman of God….That somewhere along the way of trying to do what I felt God had, and has called me to do I failed. Oh the irony. Thank you, Lord. But, truly...at the end of the day, I don’t want to be too hot or too cold…or too big or small…too hard or too soft….I don’t even want to be just right. I just want to be… His. That’s all. *I am not all versed and on the up and up on the proper ways to cite books and television shows and such. I’ve looked online for the answers, (ahem…) but, it seems there are various ways to cite. So, please forgive me if I have not done so properly. That being said, I want to point out that the photo I used in this blog post is from an Etsy vendor, Laura Walls Taylor. I don’t know her. 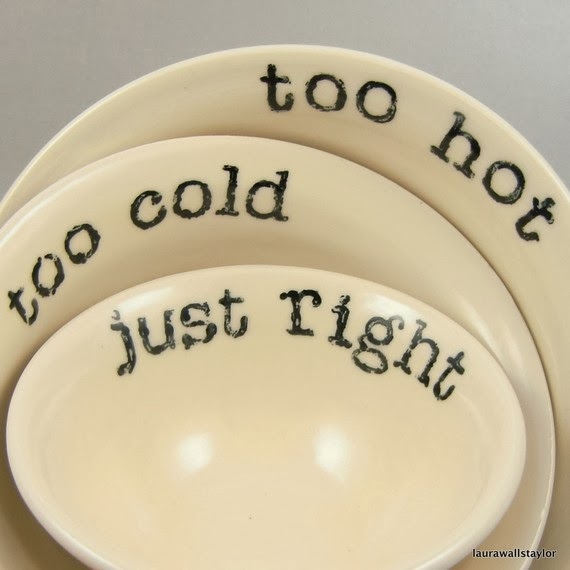 I just think the bowls are cute and they lend themselves nicely to my blog topic…so, thank you, Laura. Your bowls are um, adorable… I should probably also tell you that I don’t know Angie Smith. I met her once. I was speechless. But, I did hug her and try very hard not to act like a crazy stalker lady. She’s amazing. And, I absolutely love her books. If you haven’t read any of them, please do. I think you’ll love her too. "God didn't create junk". It's something we remind ourselves in my house quite often. Thanks for sharing.